The tailgate can be opened. The support cables will hold the tailgate horizontal. After closing the tailgate, try pulling it toward you to make sure it is securely locked. These connector covers are used when removing the tailgate, to prevent the back-up camera wire harness connectors from being contaminated. Store the connector covers in the glove box in a plastic bag when not using. To disconnect the wire harness connectors ( and ), press and hold the lock of the tailgate wire harness connector (White) and pull apart. Attach the connector cover (white) to the frame wire harness connector (Gray). Pull out the plastic wire protector located in the vehicle bed by pressing the tabs and pulling the protector. Be careful not to pull out all of the tailgate wire harness. Doing so may result in damage to vehicle components. Pull out the wire harness from the vehicle bed. Attach the connector cover (Gray) to the tailgate wire harness connector (White). Open the tailgate to the angle where you can release the brackets on the support cables from the lugs on both sides. Lift the support cable bracket up and slide it off. Tilt the tailgate to about 30° from vertical and pull up the right side of the tailgate to unhook the right side. Slide the tailgate a little to the right to unhook the left side. 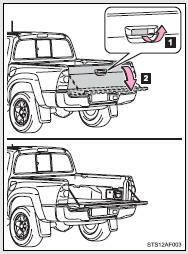 To attach the tailgate, follow the removal procedure in reverse order. For rear end protection and easier step-up loading. To get on the rear step bumper, use the shaded area in the illustration. Disconnect the wire harness between the back-up camera and the vehicle. Failure to do so may result in serious injury or damage to the vehicle components. ●Do not drive with the tailgate open. ●Do not let anyone ride on the rear step bumper. Do not pull out all of the tailgate wire harness before open the tailgate. Store the removed tailgate with the back-up camera lens facing upward. Try pulling it toward you to make sure it is securely locked. Do not allow more than one person to get on the rear step bumper at a time.